The Tibetan organization that monitors the human rights situation inside Tibet launched a new report entitled “Wasted Lives: A Critical Analysis of China’s Campaign to End Tibetan Pastoralist Lifeways,” on 30 May in New Delhi. Authored by Australian researcher Gabriel Lafitte and published by the Tibetan Centre for Human Rights and Democracy, in collaboration with League for Pastoral Peoples, the report calls on China to reconsider its current policy that removes productive pastoralists from the landscapes of Tibet. It also expresses concern about Tibet’s food security and pastoralism, while scientists consider restoration of pastoral mobility in Tibet a key to success. The only Tibetan organization monitoring human rights situation inside Tibet on Saturday launched a new report, “Wasted Lives: A Critical Analysis of China’s Campaign to End Tibetan Pastoralist Lifeways,” in the Indian capital. The report is authored by Australian researcher and environmentalist Gabriel Lafitte and commissioned by the Tibetan Centre for Human Rights and Democracy which has published it in collaboration with League for Pastoral Peoples (LPP). TCHRD director Tsering Tsomo, LPP’s projects coordinator Dr. Ilse Köhler-Rollefson and the report’s author Lafitte addressed a press conference at Foreign Correspondents Club and spoke at a formal launch ceremony at India International Centre in New Delhi on May 30. 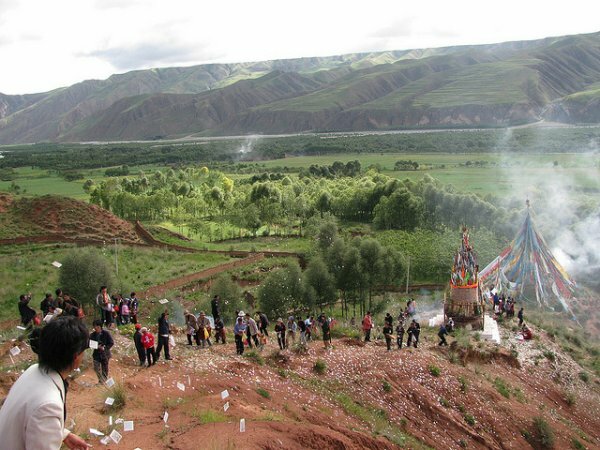 The new report, TCHRD said, is a call for China to reconsider the current policy of “close pasture to grow more grass” (tuimu huancao in Chinese) which is removing productive pastoralists from the production landscapes of Tibet. This report presents detailed evidence that China fails to understand its grasslands, and has made successive policy mistakes over decades, culminating in the current crisis, the TCHRD said in a press statement. The report expresses concern about Tibet losing its food security, and its pastoralists being now welfare dependants leading meaningless lives, with no entry into modern income sources. Far from being only a story of loss, Chinese and Tibetan scientists now agree on a new paradigm, restoring pastoral mobility as the key to success, conservation and productivity across a vast rangeland in the sky, the Tibetan Plateau. The report shows Tibetan nomadic pastoralists speaking up about China’s policy of removing them to concrete block settlements on urban fringes, where thousands of years of accumulated knowledge of rangeland and livestock breeding becomes useless, redundant and wasted. "The pastoralists of the Tibetan Plateau, though we so seldom hear their voices, have much to say in defence of their skills, lands and livelihoods, having learned to make habitable a huge plateau now being depopulated." Ilse Köhler-Rollefson is deeply familiar with the pastoralists of Rajasthan, India and elsewhere, and their indigenous knowledge as keepers of genetic diversity the world may well need in a time of accelerating climate change. Lafitte has drawn together all available information, and testimony of Tibetan pastoralists, in a "thoroughly referenced, comprehensive account of how this tragedy originated, and what alternatives are available." Gabriel Lafitte is editor of a blog on the nomads of Tibet, www.rukor.org and author of Spoiling Tibet: China and Resource nationalism on the Roof of the World (Zed Books, 2013).